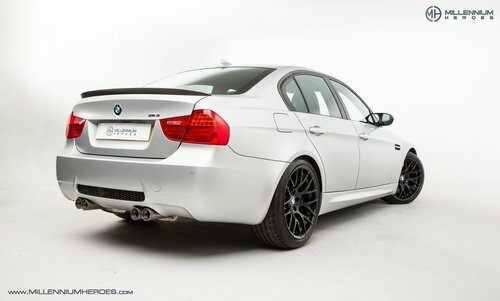 LHD, 490 Special Paint, Titanium Exhaust, Adjustable Suspension, GTS Brake kit, CFRP (Carbon Fibre Re-inforced Plastic) Seats, CFRP Bonnet, CRT Plaque, Red M3 sill strips, Aluminium layered trim, Navigation system Professional, BMW Individual Audio, Front and Rear PDC, Aux / USB input, Adaptive Headlights, BMW assist, Bluetooth prep, Rain sensing wipers, Adaptive lights, Cruise Control. 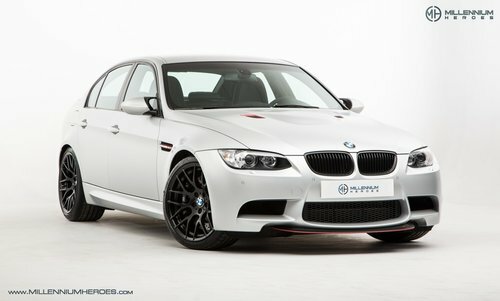 This 4 door saloon plays out the Q car role perfectly – an almost unrecognisable limited edition M Power special. 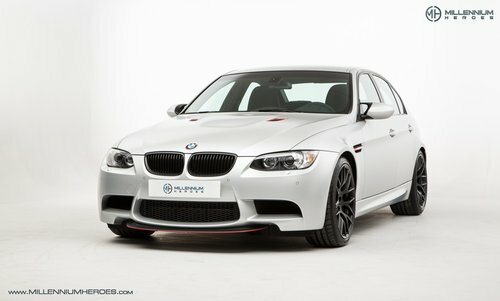 One of BMW’s most recent Individual programmes revealed the stunning Frozen Polar Silver, a menacing matte that perfectly accentuates every one of the E90’s angular lines with only the keenest enthusiast eye noticing the red accents to the unique carbon front and rear splitters. 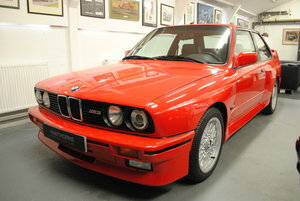 Further colour to the bonnet vents and wing gills offer further evidence that this is no normal M3. The paintwork presents in it’s original coat from the factory and is in showroom condition. Whilst the Q car appearance from the outside will slip under the radar for most, the same cannot be said for the unique cabin. 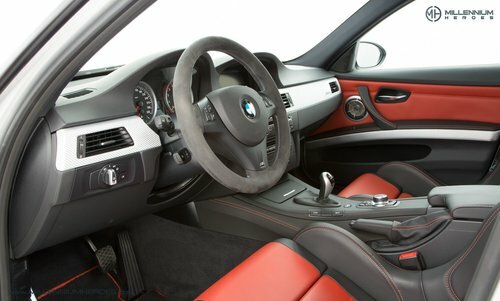 With deeply bolstered Melbourne Red CFRP bucket seats, and acres of adjoining stitching throughout, the interior feels like an event at stand still complimented by special aluminium trim, red sill strips and a super soft alcantara wheel. 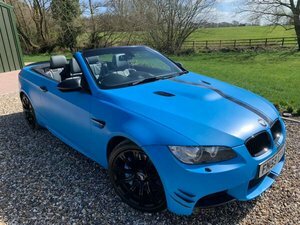 Although the focus on performance is in no doubt, BMW still engineered the latest refinements into the car with Nav, Bluetooth and the sensational Individual Audio whilst still achieving a 70kg saving over the standard saloon. 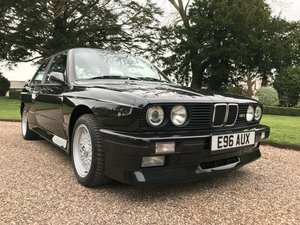 The black carpets are clean throughout, protected by as new Melbourne bordered black BMW velour over mats, and the anthracite roof lining remains in excellent order with no unsightly marks or stains. The stroked 4.4 unit now offers significantly more torque at 324 lb/ft although is at it’s best winding towards the redline with a cacophony of shrill V8, now enhanced further by the lightweight Ti exhaust and sound proofing removal. The DCT gearbox is brilliantly resolved – sharp and positive and an absolute joy to use as this S65 unit demands revs. Much is made of the necessity for the electronically controlled dampers available on the E92 platform. BMW have responded by upgrading to GTS derived coilovers that offer a default balance of supple ride and tight dynamics, naturally adjustable for both road or track. The 19 inch matte black 359M alloys present unmarked wrapped in the factory spec Michelin Pilot Sport tyres. The car sits on special equipment 6 piston fixed calipers to front, 4 pot to rear, with huge 378mm x 28mm discs; more than up to the task of reigning in the 1,500kg kerb weight from serious speeds time and time again. 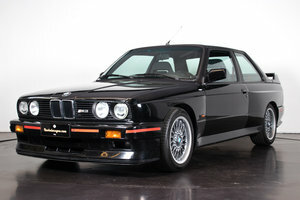 This 1 Owner CRT was delivered by BMW Spaett GmbH, Germany in April of 2013. 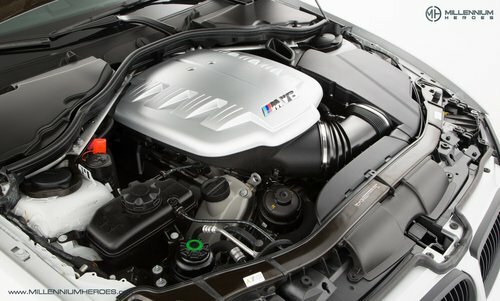 The car subsequently returned to BMW service for its running in service at 2,357miles in October the same year. The history file features all of the original literature and full book pack as well as the original sales invoice. Imported into the UK by its original purchaser it is now fully registered.